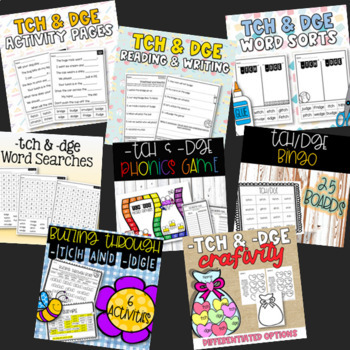 Ending Trigraph (-tch and -dge) Activities: Grab these THIRTEEN (no prep) phonics based worksheets! 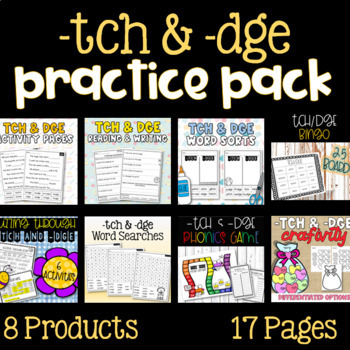 This bundle includes 5 of my products in 1! Students will practice... phonics skills, decoding, sorting, writing conventions, sentence writing, handwriting, and fine motor skills. 2 Phonics Cut and Pastes: Students read sentences with a missing word. They cut and paste the correct word into the sentence. BONUS- each cut and paste features an alphabetical order page on the back for early finishers. 3 Proofreading Pages: Students read sentences with mistakes (missing capitalization and/or punctuation.) They rewrite sentences with correct conventions (neat handwriting, spacing, punctuation, and capitalization). 4 Buzzing Through Words + 2 Word Box Sheets: Students highlight the trail of words from the bee to flower! Then, students write prompted words in letter boxes to practice letter size and formation.